Are you Worthy? Find out at the 2014 GFW PRSA Worthy Awards Gala. Honoring the best in strategic communications, the Worthy Awards are presented to Fort Worth’s most inspiring, innovative and influential communicators. Don’t miss the presentation of these awards at the 2014 Worthy Awards Gala. Thursday, May 29 • 6:30 p.m. to 9:30 p.m.
FWISD Superintendent Walter Dansby will receive the Communicator of the Year Award. A committee selected Dansby in large part due to the instrumental leadership he provided in two major FWISD initiatives last year — the implementation of a new strategic plan and a $489.9 million Capital Improvement Program (bond campaign). Both have the potential to impact the district for years and required extensive strategic communications planning and guided implementation. Don’t miss this fantastic soiree at the historic Fort Worth Club located in the heart of downtown. Tables (of 10 seats) may be purchased for $600. Need to unlock the C-Suite? Join the Greater Fort Worth PRSA chapter as we learn about agility to get the attention of the C-Suite. Texas Christian University’s own Dr. Suzanne M Carter from the Neeley School of Business will discuss how today’s “agile leader” strives to move out of silos and into conversations to become powerful influencers within their organizations. She will also highlight ways professionals and organizations can encourage and develop agile leadership from within, and how agile leadership can be used along a successful career path. Wednesday, June 11 • 11:30 a.m. to 1 p.m.
Suzanne M. Carter, Ph. D., is the Executive Director of TCU’s Executive MBA program. Currently on faculty at TCU’s Neeley School of Business as Associate Professor of Professional Practice in Strategy within the Management, Entrepreneurship, and Leadership Department, she also teaches and conducts research in the area of strategic leadership and corporate reputation. She received her M.B.A. and Ph. D. in strategic management from the University of Texas at Austin and her B.S. in Accounting from the University of Illinois – Champaign / Urbana. She has previously served on the faculty of the University of Notre Dame as an assistant professor and as an assistant instructor at the University of Texas at Austin. Dr. Carter teaches strategy courses at the EMBA, MBA and undergraduate levels. She has consulted with several non-profit organizations regarding strategic direction and taught courses on strategy and innovative social enterprise strategies. She has also been faculty on global study abroad courses in China, South Africa and South America. She has published numerous articles and book chapters in such business publications as the Journal of Management Studies, Journal of Leadership and Organizational Studies, Journal of Business Ethics and Corporate Reputation Review. She serves on the editorial board of Corporate Reputation Review. FWISD Superintendent Walter Dansby will receive the Communicator of the Year Award from the Greater Fort Worth Chapter of the Public Relations Society of America at the third annual Worthy Awards dinner on Thursday, May 29, at the Fort Worth Club. In addition to the Communicator of the Year Award, GFW-PRSA plans to present around two dozen awards to area public relations and communications professionals for strategic communications programs and campaigns, including Best of Show. The evening begins with a cocktail reception at 6:30 p.m. and dinner at 7, followed by the awards presentation. Individual tickets are $75 and tables of 10 are available for $600 at http://www.worthyawards.com. A keystone of the Worthy Awards, the Communicator of the Year Award is presented to a leader outside the public relations profession who exemplifies open, effective communication. A committee selected Dansby as Communicator of the Year in large part due to the instrumental leadership he provided in two major FWISD initiatives last year — the implementation of a new strategic plan and a $489.9 million Capital Improvement Program (bond campaign). Both have the potential to impact the district for years and required extensive strategic communications planning and guided implementation. Dansby’s nominators referenced last year’s bond initiative and his herculean efforts to educate the public about the district’s needs and engage the community in meaningful discussion. His actions to ensure success for Fort Worth’s students by drawing support for the bond election reflect his approach to community engagement at all levels. Other notable Community of the Year award winners are Mayor Betsy Price, who was honored for her open style of communication and community engagement in 2013, and former Councilman Joel Burns, who received the inaugural award. 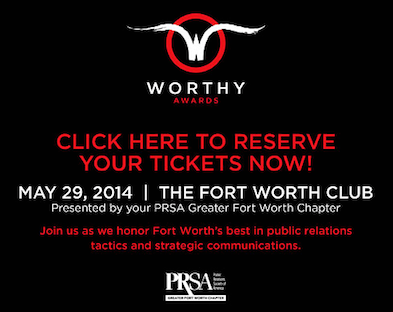 The Worthy Awards were created in 2012 to celebrate the region’s best in public relations and communications. The program is sponsored by the Fort Worth Business Press, J.O., AECOM in association with Dikita, Tarrant County College, Glen E. Ellman Photography, Crown Printed Products & Services, Ware & Associates, Ratio Digital Media, TCU School of Strategic Communication and Lockheed Martin. For more information about the Worthy Awards or for ticket information for the gala, visit http://www.worthyawards.com.